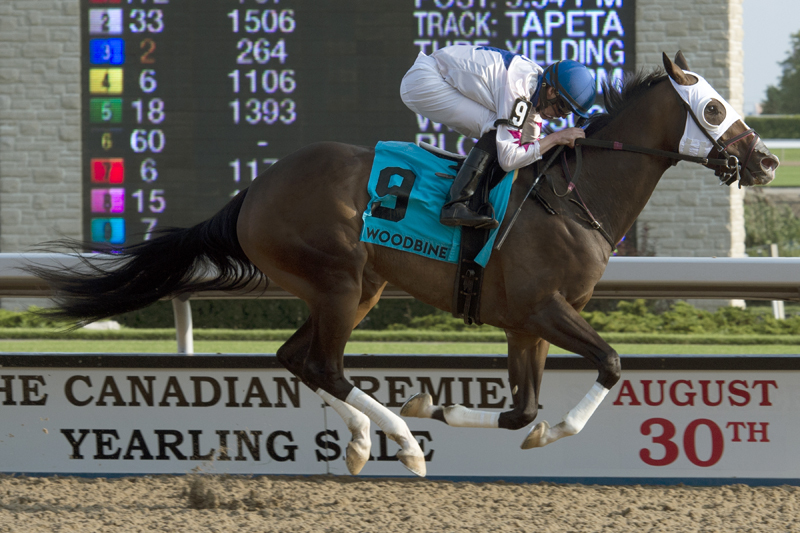 Multiple graded stakes winner Code Warrior led all the way to add the $125,000 Seaway Stakes (Grade 3) to her list of exploits on Sunday at Woodbine Racetrack. Confidently handled by jockey Jesse Campbell, the 7-1 shot fired out from post nine to establish the leading role and never looked back in the seven-furlong main track event for older fillies and mares. Code Warrior set panels of :23.30 and :46.33 before drawing off down the stretch to score in a final time of 1:22.35. Thundering Sky, who trailed the 10-horse field at the half-mile mark, ran on late to collar pace-stalker Malibu Bonnie for the runner-up honours two lengths behind. Purchased at the Keeneland mixed sale last November, the five-year-old Society’s Chairman-Lady Natalie mare has now earned three wins and a second from six stakes starts this year racing for Zilli Racing Stables. Code Warrior’s lifetime earnings soared over the $400,000 mark. She is now a seven-time career winner with seven other top three finishes in 21 starts. Code Warrior paid $16.90, $7.80 and $5.50. She combined with Thundering Sky ($7.80, $6.20) for a 9-7 exacta worth $180.30. With Malibu Bonnie ($10.30) third, the 9-7-5 trifecta paid $1,493.15 for a $1 ticket. Corps de Ballet completed the 9-7-5-8 superfecta, which returned $23,896.20 for a $1 ticket. Favourite Let It Ride Mom finished fifth while Answer My Call, 7-2 second choice Moonlit Promise, Just Be Kind, the De Paulo-trained Sister Nation and Princess Gibraltar completed the order of finish. Live Thoroughbred racing continues at Woodbine on Wednesday evening, featuring the $750,000 Yearling Sales Stakes. First race post time is 6:45 p.m.